TAG Heuer FORMULA 1 Calibre 16 timepiece, MSRP $2900. Need corporate incentive gift ideas? Need corporate incentive gift ideas? For higher budgets, the best gift choice involves repetition of use. It continually reinforces fond memories of how they got the item. To reward your best employees, a Tag Heuer watch is a gift they’ll never forget. Optionally custom engrave the case back. Is there a minimum order? If you only need a few, go to a local dealer or buy online. We sell in quantities for special events and corporate incentive programs only. Can you mix and match watch styles to achieve minimum? Yes. For example, let’s say you plan to distribute 100 watches, but salespeople need to reach different tiers to receive higher value watches. Or you need some for women and some for men. We’ll create a plan with the same brand to achieve your goals. Can you ship to a hotel? Contact us for event distribution needs. Do you sell to individuals? No, we sell to qualified companies in the US only. Can I get a huge discount? We abide by all manufacturer price restrictions. Do you offer other watch brands? Yes, We have relationships with manufacturers and dealers of most luxury brands. How can we be sure the watches are authentic Tag Heuer? All timepieces are shipped direct from an official Tag Heuer outlet. Each watch has an individual, traceable serial number. Will you donate a watch to my charity event for auction? Sorry, no. We sell in quantities for special events and incentive programs only. About Tag Heuer: TAG Heuer, the leader in prestigious sports watches and chronographs since 1860, is one of the largest and fastest growing luxury Swiss brands. The Swiss brand draws upon its active engagement in the world of sports to create the most accurate timekeeping instruments in the world. From the Olympic Games in the 1920s to its role as official timekeeper to within 1/10,000th of a second for the legendary Indy 500 from 2004 to 2006 , TAG Heuer, in a constant quest for innovation and precision continues to aim ever higher. NATALE TABLET HOLDER, Red, Green, White or Blue in stock now, low 25 unit minimum, only $11.25 with one color logo included. At this price, shouldn’t all staff with tablets have a custom tablet holder with your logo? Give them extras to hand out to customers, vendors and any ambassadors of your brand whenever they see a need. Due to super low pricing, contact us for a custom quote for set up fees. Click here for more details about this Custom Logo Tablet Case. 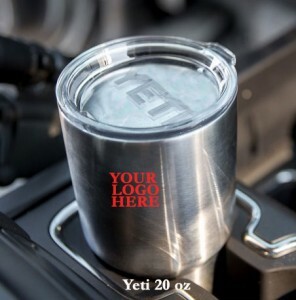 Get a yeti rambler 30 free with purchase of any custom logo gift, any brand. 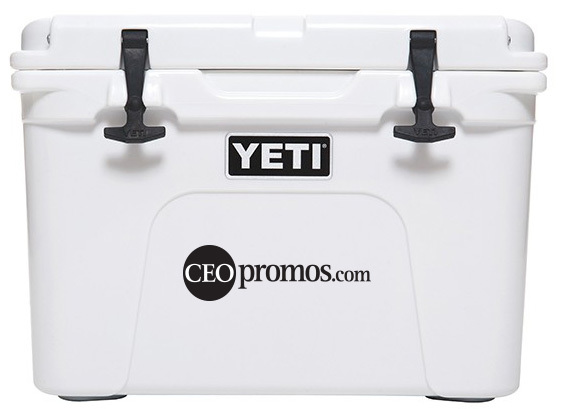 Get a free Yeti Rambler 30 from CEO Promos with any custom logo product order. Minimum 24 unit order. The Free Yeti Rambler 30 deal is available only while supplies last! Choose from blanks, folios, apparel, umbrella’s, leather gifts and more. Refer a friend, and they’ll get one too! Keep it for yourself or give as a special holiday gift, but don’t wait to place your holiday gift order. Our Yeti supply won’t last long! The stainless steep tumbler can keep a cup of coffee hot all day, or a beer cold to the last drop. Read our Custom Yeti Rambler review here. 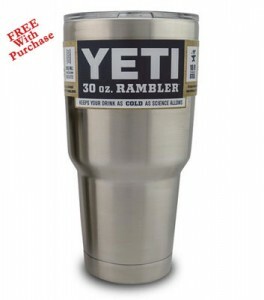 Get another Yeti Rambler when you refer a corporate customer with minimum $1000 order. Tommy Bahama, Ralph Lauren Polo, Bugatchi, Cross, Sanford (Parker, Waterman + ), Isaac Mizrahi, Windbrella, Callaway, Cutter & Buck, Zero Restriction, Pro Quip, Fairway & Greene, Linksoul, Zero Restriction, Buck Knives (Made in USA), CoasterStone, Tommy Bahama, Tica Sport Leather, and Maglite (Made in USA). Contact with your budget and needs, and we’ll help you choose the best company holiday gift ever. Welcome to CEO promos, an affiliate of CEOgolfshop.com, which has been online for over a decade. Only about half of CEOgolfshop customers are golfers, so we thought it appropriate to have a second web site with a more fitting name. Our focus is exceptional products to brand your company with quality goods. The average promotional product supplier doesn’t carry our luxury brands, which would normally mean you need two vendors- one for the cheaper stuff and one for the luxury goods. For greater efficiency, we’ve partnered with a seasoned promotional product specialist to fill the gap so you have one source for everything and one vendor to pay. We’ll guide you to the best custom promotional products for your events, giveaways, and rewards for any budget. Schantz Inc. is a 100% women based business, and Florida corporation established in 2001. CEOgolfshop.com is a Schantz Inc. dba registered with the state of Florida. Located in sunny southeast Florida, Broward County, near Fort Lauderdale, the companies currently have customers in seven countries, including exclusive resorts and spas, corporations, universities, and even other promotional products suppliers.